A triple Academy Award nominee for her original screenplays Silkwood, When Harry Met Sally..., and Sleepless in Seattle, celebrated chick-flicker Nora Ephron has returned to the big screen after a four-year (post-Bewitched remake) absence to write and direct Julie & Julia, a stirring adaptation of Julie Powell's cooking memoir of the same name and Julia Child's autobiography My Life in France. (Unless you've been living in a lobster pot, you know that the film, which opens August 7, stars Meryl Streep as the famed chef and Amy Adams as the struggling writer she inspires.) More than 20 years after Ephron infamously became an accidental anti-AIDS activist, the Huffington Post blogger chats with Advocate.com about Child's well-documented homophobia — and directs gay actors on the pros and cons of coming out. Advocate.com: How's it feel to have your name in the gay history books simply for canceling a 1987 appearance at New York's LGBT Community Center, which allowed for your substitute speaker, Larry Kramer, to make even bigger history? 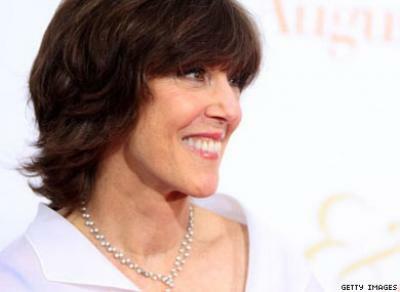 Nora Ephron: Isn't that amazing? It's like that movie Sliding Doors: You think to yourself, What possible difference does it make if you're two minutes early or two minutes late to something? The major things that change your life are like the day you meet the person you fall in love with or the day you get a job that you might not have gotten. But as it turns out, one of the most important things I did was having a cold and ear infection one night and having to cancel a speech that Larry Kramer gave instead. Thrilled as I am that I get credit for Larry's having started ACT UP because of that speech, I do think it's ironic that one of my major historic contributions was just staying in bed. [Laughs] That's a little discouraging. Do you recall what the topic of your speech was going to be that night? 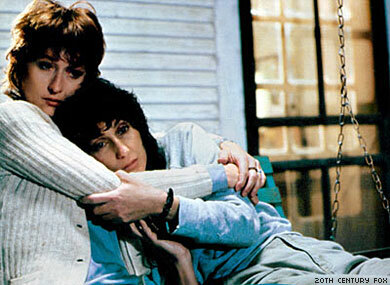 To be fair, you also earned a place in gay film history for co-writing the screenplay ofSilkwood, which earned Cher an Oscar nomination for playing Karen Silkwood's lesbian friend Dolly Pelliker. That I really do think was a breakthrough. I don't mean that she was the first gay character in a mainstream movie, but this was no joking, winking, interior decorator gay person; it was a person. That character was actually based on Karen's housemate [Sherri Ellis], who was gay, so we didn't make that up. We just made up all the plot points that went with it. You definitely sexualized Dolly, giving her a girlfriend and an unrequited love for Karen Silkwood. As this was 1983, were you met with any concerns from studio bigwigs about fleshing out Dolly's lesbianism? Not at all. They were so busy worrying about the radiation business suing us that they didn't even care. The studio's fears were elsewhere. Like many of your previous female-focused films, Julie & Julia is being labeled a "chick flick," but your romantic comedies have obviously resonated with the gay community as well. Do you ever have the gay audience in mind when you're making a film? People love to compartmentalize whom your movies are going to play with, but what you just want is for people to like them. So I don't ever think about whether or not the gay community is going to like something, because if it's all right, then of course they will. Julia Child, later in her life, spoke beautifully at a 1988 AIDS benefit sponsored by the American Food and Wine Institute. But Laura Shapiro's 2007 biography, which referenced many of Julia's own letters, brought to light her previous love-hate relationship with the gay community. Sure they were buying her books and watching her shows, but she was afraid of gay men taking over the cooking industry and making the profession less attractive to straight men. She expressed pity for lesbians and called gay men "fags," "homovipers," and "pansies." Now here we are discussing a film celebrating her life and work. Should we forgive and forget her arguably harmless homophobia simply because it was another time and, well, because she's deceased? That's an interesting question that I couldn't possibly answer for you, but Julia was wrong about many things. When Meryl was very seriously involved in stopping the spraying of apples with Alar in the '80s, she wrote to Julia Child, hoping that Julia would support the cause because that would've meant a huge amount. Julia wrote her a very snippy letter back, saying that she didn't care about or believe in that. To her the whole organic food thing was just not even worth bothering with. But she changed her mind about that and admitted she had been wrong. One of the good things about Julia is that she did know that she had been wrong about things, and I know she knew she was wrong about her homophobia. It's an interesting question of how we judge people whose politics we find reprehensible. There are people who still don't forgive Thomas Jefferson for having slaves. I believe that Julia Child was homophobic out of ignorance, but she became very good friends with lots of the gay men in the food business and forgave them all for being in the food business. It was a business that was not necessarily welcoming to newcomers, but everyone fell in love with her in a big way, and many of them were gay. Her career was launched by Craig Claiborne at The New York Times, and she was practically adopted by James Beard. There's a brief scene in the film during which Julia's husband, Paul Child, is asked if he's a homosexual while being interrogated by the House Committee on Un-American Activities. What were you trying to achieve by giving that particular question focus — is the audience supposed to question Paul's sexuality as well? No, not at all. That really happened, so I was only trying to be the dutiful storyteller. I thought it was fascinating. After they asked him if he was a homosexual — and he said he wasn't — they asked him to drop his pants. What on earth did they think they were going to discover? It gives you an idea of how unbelievably stupid [they] were. It's so bizarre that I didn't even put that into the movie because I was afraid people would think I made it up. Out directors Don Roos and Todd Holland recently advised gay actors to remain closeted for the sake of their careers at OutFest. As one of Hollywood's most celebrated directors, what are your thoughts on the subject? Well, I think people should do exactly what they want to, but I would never judge anyone, especially an actor, for staying in the closet. Getting cast in a movie is hard enough without throwing in the additional possibility that someone would turn you down because you were known to be gay. But it's no question that if more actors were willing to come out, then it would make life easier for everyone. So it's a very tricky question. It's hard to tell somebody what they ought to do about something that's essentially private in a real way but needs to be public for political reasons. You know, I love seeing that Ellen DeGeneres, whom I love, is now a spokesperson for, what, a moisturizing cream? I don't even know what it's for, but she's basically being used in the same way they use whoever those other models are. She managed to get through a time where coming out seems to have cost her, and now it just doesn't matter. Mainstream romantic comedies so often feature a flamboyant "gay confidant" role. Have you purposely avoided that sassy cliché? I was always very conscious of that. And aside from the romantic comedy gay confidant, every so often you see a straight adventure movie where there's an unbelievably stereotyped gay hairdresser who has some sort of hissy fit. At one point, after seeing Con Air, I actually called [producer] Jerry Bruckheimer and yelled at him about it because it really made me nuts. Gay kids have a hard enough time growing up without seeing this kind of overdrawn character. There's no affection in those things; it's just cheap writing. After the success of gay-themed dramas like Brokeback Mountain and Milk, is America ready for a straightforward, mainstream gay rom-com? I don't really count 1997's In & Out because it was so mired in the coming-out process. I guess you don't count Brüno either? [Laughs] I think if you make the right funny movie, people will be ready for it, whatever it is. Would you please write and direct one for us? I'd absolutely consider it, especially if I could find a story that really worked. But there's absolutely no question that it would not be a major studio picture. However many people you might be able to get to come see it, it would be hard to get one of the big studios to believe that there was a wide audience for it — until one does get made and gets the audience. Who'd you cast as your lead gay couple? [Long pause] George Clooney and somebody.